 A tricolor rice dish made from white rice, using vegetables for color (photo courtesy Nephroplus). These are the natural colors of brown rice,  black rice and  red rice. Green bamboo rice is white rice infused with bamboo extract, combining the health benefits of chlorophyll with a delightful color (uncooked rice photos courtesy rice specialist In Harvest). All rice starts as a whole grain, which means that the germ and bran layer are intact. When these are removed, you have white rice. The most common bran layer for rice is brown; remove it and you have white rice. 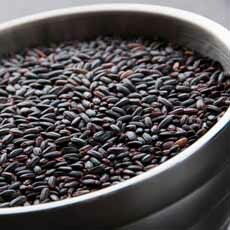 But there are also red and black rice brans. The darker the bran layer, the more nutritional value the rice has. Some rices are only partially milled, so some of the bran layer is left on. 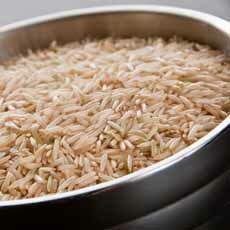 These rices tend to be light tan, pink or even a striated color. 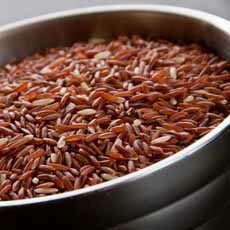 Our Madagascar Pink Rice is an example of rice that is partially milled. It still retains a high level of nutrition, but cooks faster and has a texture that is closer to white rice. But you don’t have to by naturally colored rices to serve colored rice. You can color white rice with vegetables, as in the recipe below. 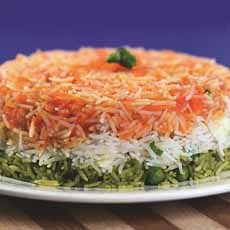 Tricolor rice is a popular dish in India, but we haven’t yet seen it in the U.S.—probably because it’s a bit more work. We did find a sweet dessert versions to join the savory rice below. You don’t have to use Indian flavors if it’s not your thing. Just add your own favorite herbs and spices, using the recipe template as a guide. 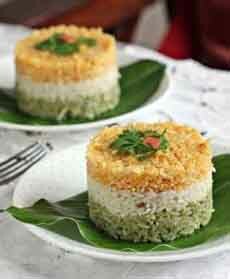 This special-occasion recipe from Nephroplus.com as an Indian specialty called a rice sandwich. Since most of us in the U.S. don’t want to labor over six individual servings, we made it in one large Pyrex bowl. Prep time is 25 minutes, cook time is 25 minutes, baking time is 20 to 25 minutes. The wonderful aroma will have everyone waiting in anticipation! 1. COMBINE the tomatoes and 2 tablespoons of water in a deep non-stick pan. Cook over a medium flame for 5 to 7 minutes or till the tomatoes are soft. 2. BLEND the tomatoes in a blender to a smooth pulp and strain it using a strainer; set aside. 3. HEAT the ghee in a wide non-stick pan. Add the onions and sauté over a medium flame for 1 minute. Add the carrots and sauté for 1 more minute. Add the prepared tomato pulp, green chiles, sugar and salt. Mix well and cook on a medium flame for 2 minutes. 4. ADD the rice, mix well and cook over a medium flame for 2 minutes, stirring occasionally. Set aside. 1. HEAT the ghee in a wide non-stick pan and add the caraway seeds. When the seeds crackle, add the green chiles and sauté on a medium flame for 30 seconds. 2. ADD the rice and paneer, mix well and cook over a medium flame for 1 to 2 minutes, stirring occasionally. Set aside. 1. HEAT the ghee in a wide non-stick pan. Add the onions and sauté on a medium flame for 1 minute. 2. ADD the green paste and again sauté over a medium flame for 1 to 2 minutes. Add the rice, green peas and salt, mix well and cook for 2 minutes, stirring occasionally. Set aside. 1. PREHEAT the oven to 360°F. 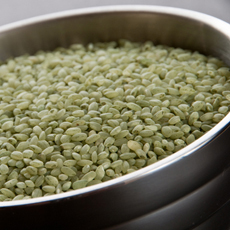 Grease a microwave safe baking bowl with oil and spread the green rice evenly over it using the back of a spoon. Add the white rice and spread it evenly using the back of a spoon. Top with the orange rice and spread it evenly using the back of a spoon. 2. POUR the milk evenly over the rice, cover the bowl with a lid and bake for 15 to 20 minutes (or microwave on high for 5 to 7 minutes). 3. SERVE: Turn the bowl upside down on a serving plate. Serve immediately.